Marcus Trescothick scored the sixth double hundred of his career as Somerset drew with Sussex at Hove. The Somerset captain made a magnificent unbeaten 210 while Peter Trego contributed an undefeated 100 as their side scored 438 for 4 declared from 100 overs in response to Sussex’s 409. Although Hampshire lost to champions Yorkshire at the Ageas Bowl, both Sussex and Somerset will need some points from their final games of the season to secure division-one safety. Sussex head to Headingley while Somerset entertain Warwickshire, but both counties will feel reasonably confident of survival. Trescothick, who agreed a new one-year contract earlier this month, will go into the finale in brilliant form after completing a chanceless 210 from 272 balls, with 26 fours and a six, in six and a half hours at the crease spread over three days. He made 153 in last week’s draw against Hampshire. The 39-year-old reached his hundred with a pull for four off Lewis Hatchett and there was no let up in the tempo of his innings nor the quality of his stroke-play during the afternoon session as he sped towards his first double hundred since 2011, despite the loss of two wickets at the other end in the space of four balls. 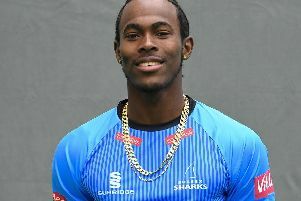 Both fell to Chris Jordan, who secured Sussex’s only bowling bonus point when he had James Hildreth athletically caught down the leg side by wicketkeeper Ben Brown for 68, having reached 1,500 first-class runs for the season on 66. Jim Allenby missed out on a flat pitch, caught at second slip in Jordan’s next over for a duck, but Trego and Trescothick piled into the Sussex attack either side of tea, scoring at more than five runs an over in an unbroken stand of 176 in 36 overs. Trescothick reached his 200 with a cut off leg spinner Luke Wells, having secured maximum bonus points for his side earlier in the over with a pull for four off Steve Magoffin. Trego, if anything, played in an even more attacking vein, particularly against the left-arm spin of Ashar Zaidi, whom he struck for two sixes, the second of which a huge hit onto the roof of the South Stand. His unbeaten 100 came off 128 balls with 13 fours and two sixes and the teams shook hands immediately after he reached the landmark. We will go to Headingley next week still needing some bonus points and it will need another good performance again from our big players. Players from both sides then formed a guard of honour for Sussex batsman Mike Yardy, who made his last appearance at Hove after a 16-year with the county before he retires at the end of the season. Sussex Head Coach Mark Robinson said: “It’s a shame because the pitch died a death a bit today and got very flat. The outfield was still a little damp so the ball got soft and it was hard work for our bowlers. “But you have to give a lot of credit to Marcus Trescothick, that was as good an innings as you will see. Somerset Captain Marcus Trescothick added: “(Coach) Matt Maynard knows my game pretty well and over the course of this season I have changed a couple of little things and it has really helped me focus on watching the ball. “I have enjoyed the last couple of weeks and scored a lot of runs but I have been through periods this year when I have been on the wrong end of things and that’s tough but we have played on a couple of good pitches, both here and at Taunton last week, and it’s been important to me to get my volume of runs for the season up.